For over 13 years, Christmas Ice Rinks have worked with councils, BIDs, and private sector companies to install beautiful, engaging, and safe temporary real ice rinks that have drawn in hundreds of thousands of additional visitors to our clients. Centrally managed by a talented, creative, and compliance-aware team led by an experienced managing director, we oversee real ice rink installation from planning to running to dismantling. Our service is flexible and what we provide you can be made to fit easily around your current staffing, space, and infrastructure. We offer skate exchanges fully equipped housed in hard wall structures. 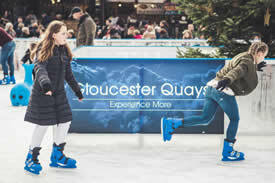 Everything we install at your prime location can be fully branded and our outdoor ice rink installation team are used to working within any space available to provide visitors and customers unlike with a magical and unforgettable experience. So, if you are looking for an outdoor ice rink company, you have come to the right place. If you’re interested in discussing the next steps, please contact us, we would be delighted to discuss your real ice rink requirements.